Our workshops and music projects are specially tailored for your needs – whether you’re looking to inspire your school pupils, guides, staff or community group, we can create a project or workshop specifically for you. Our team of experienced music leaders are committed to high quality music making and are keen to work alongside staff to create and develop a passion for music into the future. Our projects promise to be relevant, engaging and lots of fun! Our second Ginormous Choir event featuring over 400 Rainbows, Brownies and Girl Guides led by Helen Hayes at Nottingham’s Albert Hall. A lively inset morning led by experienced youth animateur Alex Patterson who took the staff at one Derbyshire primary school through lots of ideas for integrating music into the daily school routine. A Gifted and Talented project involving a host of primary schools in the Rushcliffe area. Pupils came together for an introductory session with Alex Patterson on songs based on the theme of ‘working together and communities’. Pupils were then able to practice the songs at home before coming together again at Heymann Primary School for a sharing event. 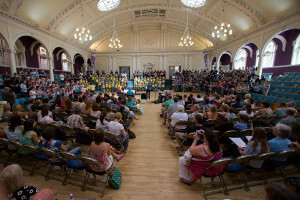 Our first Ginormous Choir event featuring our youth animateur Helen Hayes and over 400 Rainbows, Brownies and Girl Guides at Nottingham’s Albert Hall. Music and CDs were sent out beforehand so children could rehearse in their own time before coming together for a workshop before a rousing concert to family and friends. Singing animateurs from Music for Everyone lead two types of workshops, one especially designed for boys and one especially designed for girls, in six primary schools in the West Bridgford and Wilford area for children in school years 3 – 6. The Voices 2011 project culminated in two wonderful concerts where over 300 children from all of the schools came together at the Emmanuel School, West Bridgford to perform songs from well-known musicals Annie and Oliver to their friends and families. Bridging the Gap was a project managed and delivered by Music for Everyone, and funded by Youth Music. The aims of the project were 3 fold. First, to aid the transition from Primary to Secondary school. Secondly, to bridge the gap between West Bridgford and surrounding areas, and finally to help boys sing through their changing voice. ‘A good mixture of listening, singing, actions etc. Very interactive and enjoyable for all’ – Lady Bay Primary School.